This is a super easy and quick recipe, which you can hardly call a recipe actually. 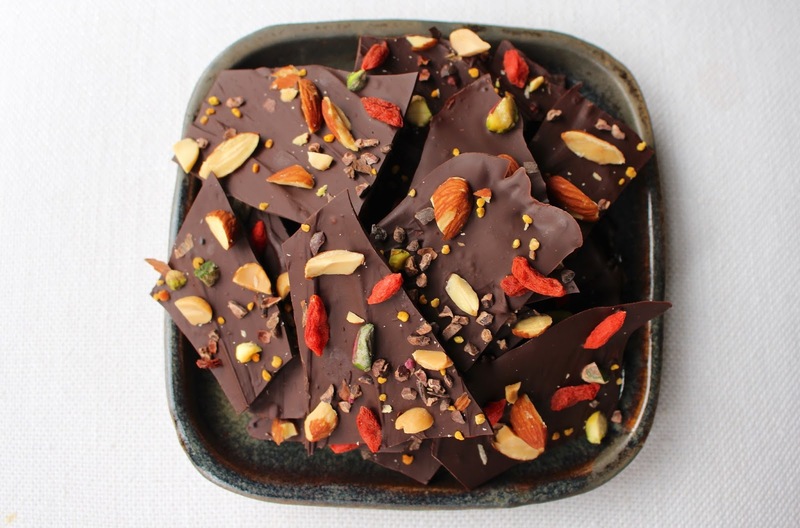 It's the kind of thing which is perfect when you have guests over and want to serve something sweet with coffee, or just when you feel like having chocolate which is a bit fancier than your average chocolate bar. 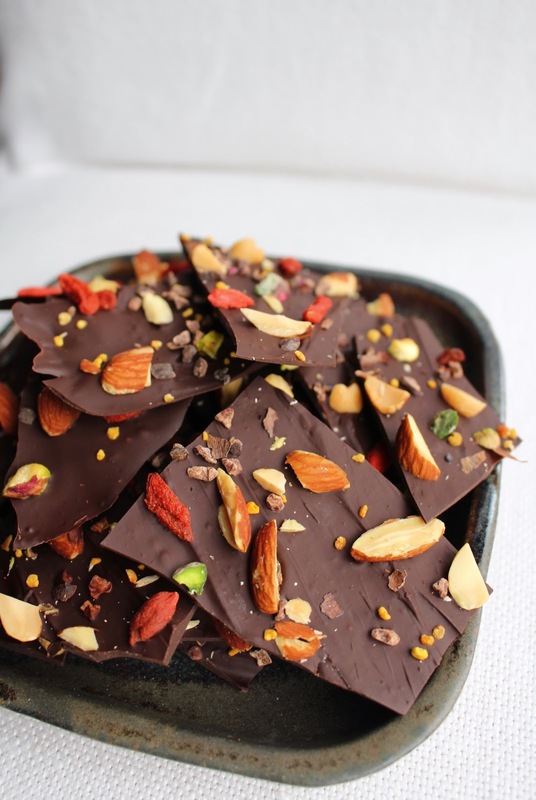 Chocolate bark is a thin layer of chocolate topped with anything you like, such as chopped nuts and dried fruit. 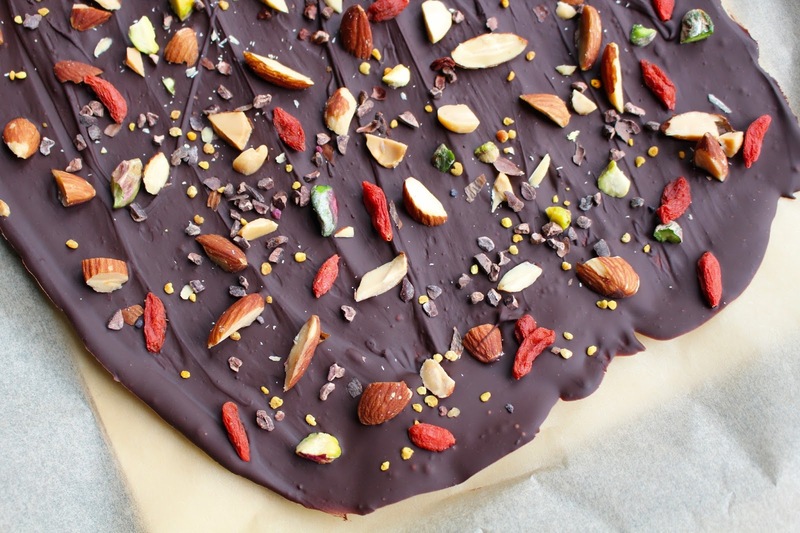 I tried chocolate bark with cacao nibs and sea salt in Moscow and realised it would be really easy to recreate at home, so here's my version! Start by melting the chocolate in a little pan on low heat and keep stirring until it's completely melted. Then take a baking tin and line it with baking parchment. Pour the chocolate over it and smooth it out with a spatula. You can make it as thick or thin as you like. I like very thin pieces. 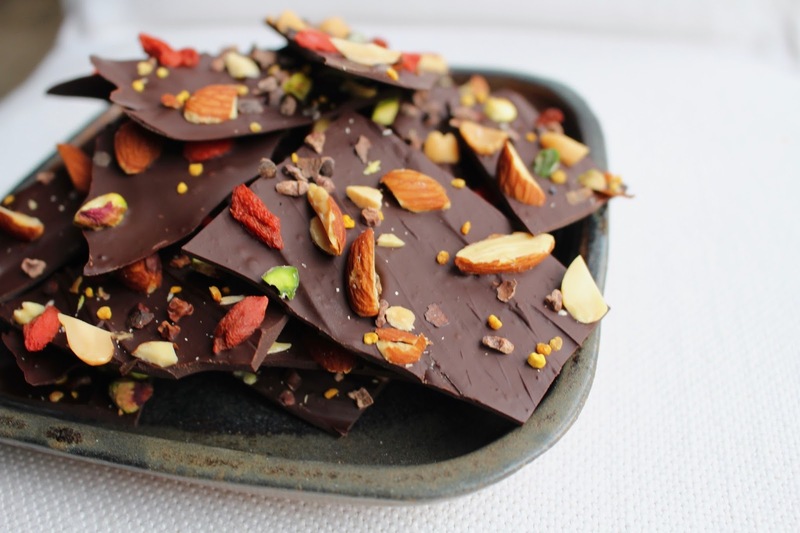 While the chocolate is still melted, top it with chopped nuts, dried fruit and other toppings you like. Make sure to sprinkle evenly and don't add too much. Pop the whole thing in the fridge for an hour or two, depending on how thick the layer is. Then either chop the slab into squares or break into shards like I did. Keep in the fridge or somewhere cool. I really love the texture of this! Biting into a shard feels like taking the first bite of a Magnum ice cream (who doesn't love that?) Then you get the mix of flavours and textures; chewy, crunchy, sweet, bitter, salty, nutty... I could think of lots of other really great combinations. Just play around with it and try different toppings. It's a really quick and fun little recipe to make!